My objective is to work for a community or university to not only facilitate learning but to help grow the business department. I bring my professional, hardworking, and ethical behavior to all that I do. My journey started by just wanting a job that would work with family life and that began by working at a bank part time. After eighteen wonderful years working in the banking industry, wearing many different hats in that career, my life changed course. I went back to school to get my teaching degree in business education and three years later I graduated and began teaching at our community college and a year after that began teaching in the business department at Spring Creek High School. I am not sure where my life will turn next but I have learned that I must be open to changes and with that mindset there is nothing I can't do. 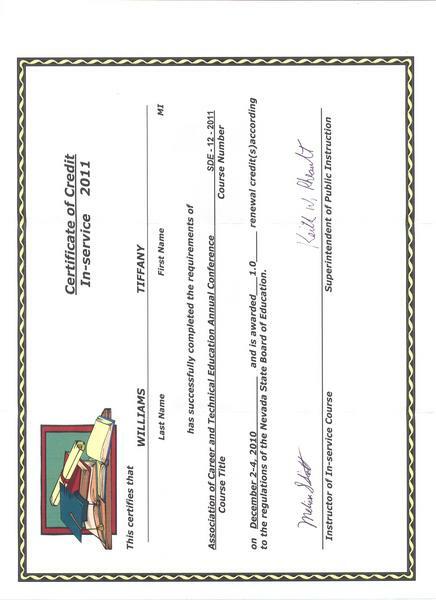 I have been teaching Business 101 and other various business classes for Great Basin College over the past three years. This entry level course requires a high level of involvement as it is mandatory for many degrees through Great Basin College so therefore, enrollment is high. I have received high scores from the online students that have taken this course in relation curriculum. Provide excellent classroom management while creating a diverse learning environment by teaching current business curriculum and connecting it to the real world. I have been instrumental in creating a semester Personal Financial literacy course that is taught to all sophomores by the business department. Responsible for helping open and train the manager and staff for a new grocery store branch. I was the assistant manager while also performing the role of new accounts and loan officer. I was responsible for operating efficiently, managing a staff of six to eight people, kept in compliance with government regulations while launching a branch from the ground level up. In the first ten months this branch did almost $1 million in loan production. This employment was to be only the three years I anticipated as I had to leave to complete my student teaching for may bachelors degree. I began my career as a part time teller, then full time teller, new accounts personnel, service manager, and then a branch manager. I was responsible for operating a branch efficiently and effectively. I was scored on wait times, satisfaction of service, loan production, referrals to our partners, sales per day, and profit per day. I also was responsible for the training of my service manager, the new accounts staff, and the hiring and firing of staff. This was a challenging job and rewarding job. Our branch was ranked number one in our district for the last two years I worked for Wells Fargo. I have been using Microsoft Office Suite for the past ten years. This has been used in my professional and personal life through power points for presentations, to using Excel as a database.